This article contains frequently asked questions about using Lync audio and video. Can I use Skype for Business (Lync) to make a call? 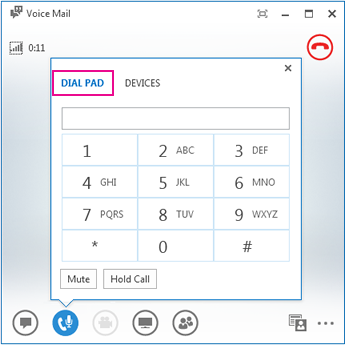 Where is the Skype for Business (Lync) phone dial pad and how do I use it? How can I add my numbers to my contact card? See Set up, test, and troubleshoot Skype for Business (Lync) audio for instructions. Using Dial Pad to call a number. A Lync call is made from your computer to the computer of someone else who is also using Lync (computer audio). If your company supports it, you can also make Lync calls to federated contacts. A federated relationship with other companies is just a virtual alliance that lets you add users from other companies to your contacts lists, send them IMs, make audio, video and conference calls, and exchange presence information. You can also use Lync to call a regular phone line, just like a traditional desk phone. Start the call by using the dial pad to dial a number (see the next section for details) or pausing on a contact’s picture and using the menu on the phone icon to choose a number to call. For more information, see Make and receive a Skype for Business (Lync) video call. In the Lync main window, on the Phone tab. In the conversation window that opens when you start a call. Pause on the phone/mic icon to see the dial pad. Yes. You can type a phone number in the search box, on the Contacts view or Phone tab, and, in the results, double-click the number that you want to call. You can also dial the number by using the dial pad on the Phone tab, and then clicking Call. And, you can call someone by searching for him or her. Type the person’s name in the search box, and, in the search results, pause on their picture, click the drop-down menu next to the phone button, and pick an option to call. In the Lync main window, click the Options button, and then click Phones. Under My phone numbers, click a box, and type your number. Use only the digits 0123456789 and no parentheses or hyphens. When adding international numbers, type the + sign and then the country code followed by the local number. Select the boxes next to the number(s) that you want to show on your contact card. Use a high-quality audio device, replace any defective or damaged devices, and run the set up to make sure it works correctly. We recommend you use a device listed in Phones and Devices Qualified for Microsoft Skype for Business (Lync). Most headsets have a button to adjust the volume depending on which audio device the headset is connected to. If you or other callers hear a buzzing noise, make a test call, and then adjust the settings on the headset until the buzzing noise is gone. We recommend that you don’t make calls over a wireless connection, virtual private network (VPN), or remote access service (RAS) connection.